Perfect for offices or homes, the Skywell 5 generates up to five gallons of clean drinking water per day — hot or cold. The Skywell App and interactive touchscreen engages users and offers water consumption data and environmental facts. The Skywell takes in and filters the surrounding air, removing dust, airborne particles, and bacteria. It is then condensed on a cooled surface. The result is Air Water. It’s well-informed on environmental and health issues related to drinking water. Take our daily EcoQuiz to test your knowledge on the environment or create your own unique Hydration Profile, which allows you to set daily hydration goals, indicates water consumption, and lets you know how many plastic bottles you’ve saved as a result of using the Skywell. Even casual Skywell users will begin to think differently about drinking water. The Skywell comes equipped with an interactive touchscreen and dashboard that indicates available water temperatures, current water tank level, and water production capabilities for that given day so you always know how your Skywell is doing. 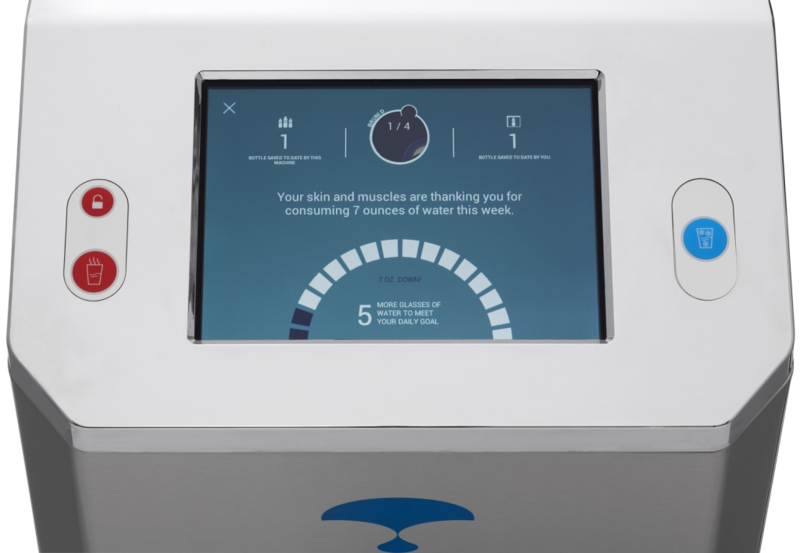 The Skywell offers you the unique ability to create a Hydration Profile so you can access personal water facts such as the amount of water you have consumed to date and the positive environmental impact you’re having from using the Skywell. Plus, you can set daily hydration goals and track your progress every day. The Skywell represents the future of drinking water, with many meaningful advantages over other common water sources. You control your own water — eliminating your reliance on potentially contaminated municipal water and a decaying water delivery infrastructure. Decrease your water and carbon footprint. Did you know that water requires pumping, piping, and shipping to a treatment plant before it can even get into pipes and dispensed from your water taps? The Skywell eliminates the need for this cumbersome and energy consuming process that heavily impacts our environment. No trucks delivering big plastic bottles that require handling and storage — or single-use plastic bottles that pollute our oceans and clog our landfills. The Skywell greatly reduces the severe environmental cost of disposing billions of single-use plastic bottles worldwide. Over 80% of these bottles are never recycled, leaving them to decompose in our oceans, rivers, and landfills — a process that can takes hundreds of years. The Skywell App allows you to track your water consumption on a daily, weekly, and monthly basis, as well as monitor the positive environmental impact that results from your reduced usage of plastic bottles. Plus, it offers you the opportunity to brand the Skywell with your company’s logo.